So simple and quick to make you won’t believe it. You also will not believe how good they taste. You might even feel guilty. If you weren’t so busy eating them all. I think you’ll forgive my obsession when you realize how flipping cute these are. 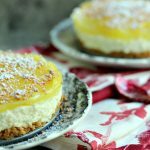 They are also the easiest little cheesecakes in the world to make. We’ll call them “cheater cheesecakes”. And we won’t even feel a little bit bad about it. and about .357 seconds to inhale. If you are a regular reader you probably know I’ve been wicked sick this week. Fever, shakes, the whole nine yards. I had planned to make a very complicated, full on crazy full size turtle cheesecake. But let’s be honest folks, baking, and eating for that matter, are not fun when you’re flat on your back with a fever of 101. So I cheated. I made Tiny Turtle Cheesecakes and I adore them. Quite likely the simplest dessert I’ve ever made in my life. Quite likely the cutest too. So simple and quick to make you won't believe it. You also will not believe how good they taste. You might even feel guilty. If you weren't so busy eating them all. 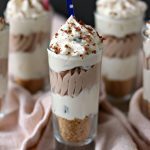 In tiny little shot glasses put about 1 tablespoon of oreo crumbs on the bottom. Tamp it down. Add the philly spread and tamp down. 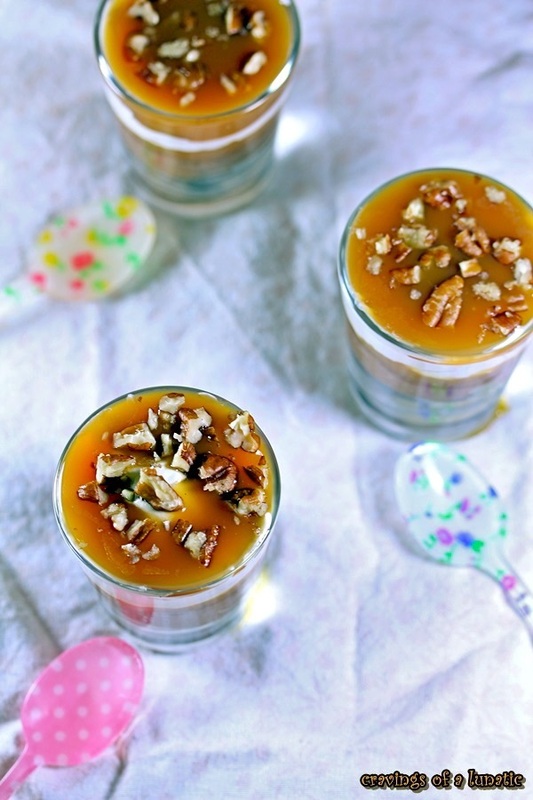 Add half the caramel sauce to each cup. Add the whipped cream to each cup, and smooth it out. Add the other half of the caramel sauce. Serve with a big old Turtle smile! If you want a firmer base add about 2 to 3 tablespoons of melted butter to the crumbs and mix well before filling the cups with it. A big thanks to our Sunday Supper fearless leader Isabel of Family Foodie. She works so hard for all of us. Also a huge thank you to our lovely hostess, Angie from Big Bear’s Wife. You ladies rocked it out this week. 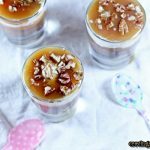 Oh my god I am in LOVE with this recipe my friend, this looks so delicious! Thanks so much Uru. It’s just so simple, doesn’t even seem like a recipe. It’s so out of control but I can’t help myself. Thanks, luckily they are super quick. PS…look at your cute spoons!!!! Ha, thanks. I still can’t believe they shipped here. So many places don’t. These are precious! And so easy to assemble. Looks like you slaved all day to create them though. I sure hope you are feeling better, at least well enough to eat your share of these. I love dishes that look complicated but really aren’t. I get such a kick out of it when folks think it took me all day. Must be the little devil in me. I figure another day or so and I should be back to normal. Bah ha ha. I cannot stop laughing. It gives me great joy to creep you out. Turtle lovers unite. You are the turtle queen! Love it, love it, and love it some more. Bring on the turtle recipes because you know I love the turtles. Lol, thanks. They just speak to me. So glad I’m not the only one. Oh my gosh!! 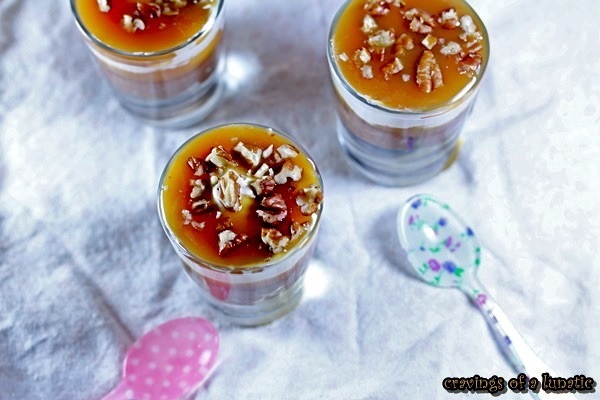 These would be so quick and easy to make when I have a I need for cheesecake right now mood! I love the flavors you used and mmmm, who doesn’t love turtles?? Thanks Jennifer. I tend to love doing quick and easy dishes. And who doesn’t love turtles, right. Oh wow… not only do they sound amazing… they LOOK amazing!! So cute in those little glasses!! Thanks so much Nicole. I had fun playing around with the styling. Tiny = more for Jen to eat! Lol, I know right. I have a problem. Thanks so much Paula. I just love to bake, but this is the best I could do sick. They turned out pretty good. You know, you’re real good at this turtle thing. You might want to think about making more of them. 😉 Really fun and creative. And I’d gladly dedicate .357 seconds to snarfing these! Good stuff – thanks. Lol, thanks John. It’s like a gift, or a sickness. I love them way too much. Kudos to you for doing anything while sick. If that were me, I’d be completely lazy. Thanks DB. Luckily this was a quick recipe. Oh my goodness, these are so stinkin’ cute!!! Thanks Conni. They were fun to make. Oh wow! Think you could mail some my way? 😉 These look delicious! Thanks Crystal. I wish I could. Or have you over for coffee and cheesecake. Thanks so much Diana. I had fun with this one. I’m amazed you were still able to make these little decadent stunners this week, Kim! Poor you. When I’m sick, I’m the biggest baby in the world. You can’t get me out of bed for anything. Weeeeell, maybe I’d get up for one (or three) of these since I love turtles so much. 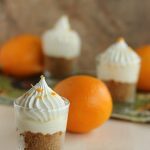 This week’s Sunday Supper has opened my eyes to this amazing Philly cheesecake filling product. I never knew they made it! Next time I don’t want to bake my own, I’m getting a tub and spooning it into my mouth in front of the tv. I hope you feel 100% better soon! Thanks so much Nancy. I was pretty much doing what you would do last night. While I was making these I was also making black forest bites and scarfing them while I was taking pics. I love that they sell the spread now in chocolate. It’s fab and quick. Hope you are feeling better soon!! These sure are cute and I think I would inhale one in 3.56 seconds!! Thanks Tara. You are so sweet. Hope you are feeling better! These little cuties look delicious! Now this is the kind of cheesecake I can handle making. Yum, yum! It’s just so easy and yummy. Turtles are my mom’s fave, she’d love this! Mine too. You’ll have to try them when she visits. I just laughed when I read on the list you were making Turtle Cheesecakes 🙂 I like how you dont have to let these chill overnight! Yay instant indulgence! I am nothing if not predictable. I wanted to do a full on beautiful from scratch dish but man I was just too sick. This is a great thing to whip up when someone shows up at your door at the last minute. These are adorable, and I’d rather have something like this than a heavy, dense cheesecake. Hope you are feeling better! Thanks Brianne. I feel the same way. So much lighter this way. Starting to feel a tad better. Yah! Go Turtle Power!!!! 🙂 Feel better Kim! Adorable! Alas I’m not a great baker, even if cooking isn’t required – desserts hate me. I may commission my little brother to make these. I don’t know why I’m using the word “commission”…I certainly won’t be paying him. Just inhaling in 0.3 seconds. I used to be the same way. 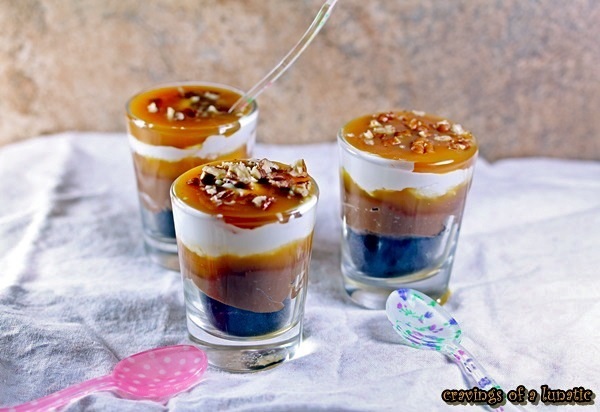 Tackle something simple like this and the dessert world is your oyster. I realize that’s a bad way to put it. The world is your cheesecake?? I bet you could whip these up no problem. You cheated? Really? These look too perfect for you to have cheated. I want to take one of those tiny spoons and dig in…deep! Yum! Feel better, Kim! Hope you’re feeling better! These look lovely, and it’s great to have simple desserts like this up your sleeve for surprise guests. Turtle is one of my favorite flavor combos, so I’m completely sold! Awww. Delicious treats are a great way to heal from a cold. Feel better!!! 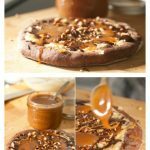 Ooh I love such easy recipes since I’m not that good a baker!This looks so super easy and so delicious not to mention fast :)Yumm..
Yum! 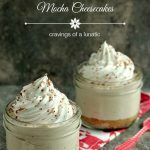 I love no bake cheesecakes!!! I NEED these in my life, like asap! Those are so cute and I love the layered look in the glasses! I love easy desserts like this. I’m not one for waiting. Baking and then cooling is just too much. When I want cheesecake I want it now! I hope you’re feeling better. A dessert like this would have me on the mend in no time flat. I love the automatic portion control too! I’ve read through all the description and comments and don’t see how many servings this makes. Could you please let me know? Hi Kimme. I believe it serves 8 but I’ll look through my old notes in my office tomorrow.